LED PL lamps, specifically named for the original manufacturer, Philips Lighting, is easy on energy consumption, yet they can be a bit complicated to understand. To take the guess work of it, here are a few facts about PL lamps. The brightness level of PL lamps is determined by lumens, which measures how bright a bulb is. This is different than wattage, which measures the energy output of a lamp. 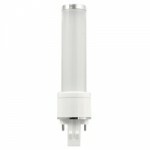 The five- and seven-watt LED PL Lamps are available in GU24, E26 as well as GX23 and G24q pin base options to replace 13- and 18-watt compact fluorescent lamps (CFLs). LED PL lamps have up to a 50,000-hour lifetime, and deliver an 80 color rendering index (CRI) with uniform consistency compared to CFLs. 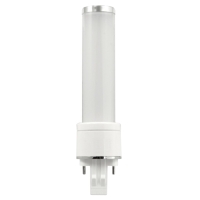 The lamps operate on a 120-277 volt system to easily retrofit into a variety of residential applications, including recessed cans, sconces, and ceiling fixtures.